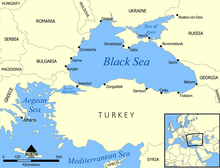 The Black Sea is a sea in Eurasia between Europe, Caucasus, and Anatolia. Many big rivers connect to the Black Sea, like the Don, Danube, and Dnieper rivers. It is connected to the Atlantic Ocean through the Mediterranean Sea, Aegean Sea, and many straits. 90% of the sea has no oxygen. The water is saltwater but less salty than the ocean. During the last ice age, the Black Sea was a freshwater lake. In Greek mythology, the Argonauts traveled on the sea. Greeks set up colonies around the sea because it was important to trade for many countries in ancient history. The Gallipoli Campaign during World War I was a fight for access to the Black Sea. It was also important in World War II. The Black Sea sits on continental plates which have subsided. It is a geologic basin, and therefore is a genuine inland sea. Its maximum depth is about 2000 metres. The Black Sea is the world’s largest basin where the deep waters do not mix with the upper layers of water that receive oxygen from the atmosphere. As a result, over 90% of the deeper Black Sea volume is anoxic water. The upper layers are generally cooler, less dense and less salty than the deeper waters, as they are fed by large river systems, whereas the deep waters come from the warm, salty waters of the Mediterranean. The Crimean Peninsula divides this sea. The Bosporus and Dardanelles connect the Black Sea to the Mediterranean. ↑ Nikishin, A (2003). "The Black Sea basin: tectonic history and Neogene–Quaternary rapid subsidence modelling". Sedimentary Geology 156: 149–168. doi:10.1016/S0037-0738(02)00286-5.